For the most part a lot of people aren't even aware that there are in fact 2 roulette wheels. European version which is a single Zero, and the American version with the Double Zero. The major difference being that the Double zero (American version) has twice the house percentage than that of the single (European version). This means that you should always avoid playing with an American double zero wheel, as the odds are already against you. It works out something like European single wheel is (2.7% house advantage) and the American double zero wheel is around (5.26% house advantage), so straight away your strategy should be to play the European version. How about that ay ? Saved you a fortune within the first 5 minutes !. Now comes the bomb shell ! and this one is going to either hurt because you have already paid out money or make you feel smug because you were already too shrewd to buy into the hype. The sad fact is there are no "winning Roulette systems" or Roulette Strategies that are going to make you rich. Not even well off, because the sad fact is its a mathematical impossibility. Now read that again "its a mathematical impossibility". That is correct ! no matter what you have heard, what your friends say or what father Abraham said down the street. 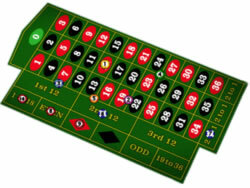 Its a 100% mathematical impossibility to beat the roulette wheel because the odds are always in the casinos advantage. The whole point of having a zero on the roulette wheel is there to give that percentage factor in favour of the casinos. Its how they make money, its how they stay in business and its also how they build multi-million pound hotels down the las vegas strip, sorry to break it too you my friend but its true. The roulette wheel is known as the kiss of death amongst professional gamblers as the house advantage to the casino far out ways any profits ever made. 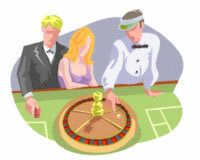 Roulette should be seen as a game of chance and a game of fun. Never go to a roulette table thinking your going to win because the advantage dictates that your not. I mean that does not mean you will never win, or that everyone will lose as some people have hit a nice stack playing roulette as the odds at 35/1 are so lucrative. But i guarantee overall from the amount of times they have won and lost. The loses far out weigh the wins. I personally will only ever play a certain amount on the roulette wheel, usually if i feel lucky, have already had a big win or have some spare change to play with, but once i have either won or lost - thats it - i walk away, and i advise you to do the same. Treat it for what it is. Its a game of chance and enjoy it for that very reason, because lets face it, it is probably one of the most alluring and attractive games within the casino and with odds of 35-1 for hitting a number its always nice to have a little spin - Good Luck! If your article on Roulette Strategies has give you food for thought then take a look thorugh our other Roulette articles coversing everything from the history of the game through to our top 10 hints and tips for increasing your roulette winnings.